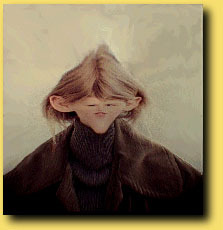 ELASTIC SURGERY is an artwork that allows a participant to perform subtle or gross distortions to his or her own face. While some of the changes may be possible by conventional plastic surgery, most could only be achieved by these electronic means, unless one's head were made of clay. The latest incarnation of Elastic Surgery I call Elastic Surgery RT. The RT stands for "Real Time". Now there is no longer a need to freeze your face before the warping is performed. The mirror acts like a true mirror, with the warped image updating 30 times a second with a full video resolution of 640x480 pixels. In the past this was possible only with a very expensive computer such as a Silicon Graphics Onyx, and even with powerful hardware the results weren't very impressive. Utilizing the newer very fast PC's coupled with optimized code and the Linux operating system, I've been able to achieve performance that even I can't believe. The new configuration uses a 17" LCD panel mounted vertically (portrait mode) with lights around it to make it appear like a vanity mirror. 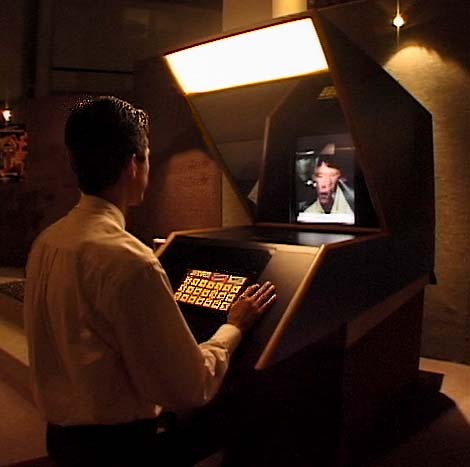 Seventeen buttons in front of the mirror enable various pre-computed warps. When a button is pressed the new warp "morphs" or "tweens" from the previous warp in about 2 seconds. The effect is as if the mirror were being reshaped before your eyes. A" freeze" and an "unfreeze" button are also included. Please play the demonstration clip below that is best for your internet connection. One warp will stretch the ears out. Another may squash one's head and extend the chin in an impossible way. It seems that no matter how extreme the distortion, the participant's identity is never completely lost. ELASTIC SURGERY graphically demonstrates the brain's ability to recognize faces and note differences between them. We all wonder how we might look if our features were altered, and this work can answer some questions. This work also demonstrates the technique of "warping" with a computer, a special effect used in many commercials and movies. 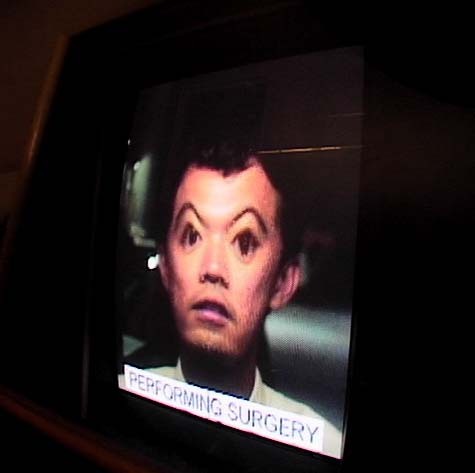 ELASTIC SURGERY is currently on permanent exhibition at the Singapore Science Centre; Contemporary Arts Museum (Tempozan Gendaikon), Osaka, Japan; Exploratorium, San Francisco; and WonderWorks, Orlando. 6MB Quicktime movie for those with a great connection. Quicktime 4 required. Good quality.